Nobody was tracking humans in Tora Bora prior to 1990. They had as much motivation to do so as they do to track bipeds on the Olympic Peninsula. Why in Sam Hell would DoD care about ape men? DoD wants and needs wizards to operate their new and improved high tech weapons. Hell, you almost need a post-secondary degree anymore just to navigate all the required computer training they throw at you every time somebody gets pissed off, sexually assaulted, or racially insulted. I'm really having a difficult time believing that so many people are missing the obvious here. Can we all admit that this entire planet is simply ripping itself apart with tribalism, racism, and jockeying into position to get control of "the other guys", and y'all can't understand why government might want to suppress the introduction of a whole new class of yet more guys? We have a whole subset of people on this very forum claiming to read their minds, the freaking lawyers haven't even entered the arena yet, and you think that the only folks who have a stake in the deal are the guys who salute any dippity-doo that we elect as he stumbles onto Marine One? Even way back I had always said SOMEONE knows so who is that person. Right. So .. I think that question has a bit finer granularity as well. It's not just "who knows" ... I suspect many here have identified people they suspect of knowing more than they share. The whole question, i think, is who, among those who knows, will a) share, b) admit having something to share, c) admit there exists anything to share. So far, nothing verifiable. I don't think we're going to force cooperation out of anyone. If that would work it would have worked long ago. If there is a conspiracy to conceal evidence, then something of what is known about what is being concealed entices willing participation rather than coerced participation. .. or at least that's my best computed guess based on the available evidence. ^^^ A bucket full of plusses for that one, MIB. So, whaddaya think then? Would anyone at WADNR who was at the nesting site be a good candidate for contact? What might Derek Randles know? He supposedly is one of us right? I mean it would be kind of cool to see what honest conclusions DNR would have about the situation. They would just probably say that Humans built the structures? It would seem like an OCCAM's Razor kind of answer. Easier anyway and wouldn't open up anything out of the box. First, it's becoming pretty clear that these creatures are human enough to justify these thoughts and conversations. If they are classified as not within the genus Homo, then pretty much all of paleo-anthropology will be in upheaval. The vast majority of the dug up ape man bones will be in danger of being reclassified. Secondly, being of the Homo genus and being aboriginal to the North American continent and United States in particular, our current government structure places their status not within the purview of our fish and wildlife departments (co-managed by state and federal governments), but purely within the authority of the federal government. This isn't wild speculation here. It's common sense based upon a broad view of government structure. It also pretty much explains the stand-offish attitude of our forestry, land management, and wildlife management agencies, and legally justifies their negligence toward this phenomenon to a certain extent. As a nation, we have not recognized the rights and status of this native peoples. These natural resource agencies have no boundaries, guidance, or authority to deal with these questions. Thirdly, that narrows us down to the appropriate authorities who must deal with this issue: the State Department and/or Bureau if Indian Affairs. Though I'm not completely certain about this, I believe that the State Department is required to negotiate a treaty with an aboriginal tribe, and that treaty ratified by Congress, before authority to administer that treaty is granted to the BIA. To our new forum participant (jsydor), DoD's legal authority is also limited by law, just like eveybody else's. They cannot run out willy-nilly and deal with the "wild Indians" until authorized by Congress in a declaration of war. Now, if an aboriginal hominid is shot dead on Ft. Lewis for trespassing and failing to respond to orders to halt, and the Army examined the carcass, realized that they needed legal guidance, and turned it over to "somebody else" (all of which I have every reason to believe has happened somewhere within the past century and a half), they've done their jobs and are absolved legally from further responsibility. This issue is a State Department issue, and to secondary extent, a responsibility of the FBI (our internal federal investigative agency, and who have likely recieved notification of sasquatchery from local and state law enforcement agencies). So, folks, there you have it. There is your legal reason why government has so fully failed to deal with this issue. It's a matter of law. I agree that we won't force anybody to talk without first producing a freshly dead sasquatch on a slab that they can't make disappear, or perhaps a significant skeletal fossil of recent life (within a thousand years or so). It also pretty much explains the stand-offish attitude of our forestry, land management, and wildlife management agencies, and legally justifies their negligence toward this phenomenon to a certain extent. As a nation, we have not recognized the rights and status of this native peoples. These natural resource agencies have no boundaries, guidance, or authority to deal with these questions. Then protocols must be in place defining those responsibilities or policies and whose purview the creatures are isolated too. New Rangers might be informed of this so that they can at least manage the BF's that may wander around campsites? Or frighten visitors? Or know what to say to them to diffuse any alarmists. Doesn't explain the retired whistleblowers though they never have proof that BF's exist when presenting reports to the public. I wonder if anyone in the forestry service, Park Service, or any of the more than 2 million volunteers have ever found a dead one. To our new forum participant (jsydor), DoD's legal authority is also limited by law, just like eveybody else's. They cannot run out willy-nilly and deal with the "wild Indians" until authorized by Congress in a declaration of war. Now, if an aboriginal hominid is shot dead on Ft. Lewis for trespassing﻿ and failing to respond to orders to halt, and the Army examined the carcass, realized that they needed legal guidance, and turned it over to "somebody else" (all of which I have every reason to believe has happened somewhere within the past century and a half), they've done their jobs and are absolved legally from further responsibility. I agree that we won't force anybody to talk without first producing a freshly dead sasquatch on a slab that they can't make disappear, or perhaps a significant skeletal fossil of recent life (w﻿ithin﻿ a thousand years or so). Humor me and lets suppose its a new breed of Gorilla found. Squarely in the animal camp..... As Humans have nevered signed a treaty with Gorillas? yeah, .gov never violates first, second, or 4th amendments rights.. Ya know? On the difficulty scale of acquiring proof of this creature's existence it would certainly seem to be that emails are infinitely easier than locking and loading in some mountain ravine somewhere that took someone four hours to trudge to. Then shut off the phone, pull the battery, wait around to see if a BF shows up, grass it, steal a head, get out alive with no other BF's wanting to tear you limb from limb and secretly take the specimen to someone with a lab who will study it without telling anyone. Emails? Even a lot of emails? Oh yeah, much easier........um.......except for the fear factor one might experience for meddling in government or state affairs which we pay taxes to in order for them to even function. I mean ANYONE can send an email right? If no one wants to Iand I don't understand why that would be) then get me the contact info for the Sate of Washington Department of Natural Resources and I will do it. Could someone at least do that? Or if someone knows Derek Randles or Cliff Barackman personally then ask them. I mean really, is there any harm in doing just that one little thing? Well so far the evidence points to the fact that they have been successful 100 percent of the time whisking away evidence. Why would they change methodology? We have so many stories, and that is just what they are, about BF injured or dead, being hauled away by State and Federal Authorities. Mt St Helens eruption, forest fires, BF hit and killed by truck hauled away, etc. Throw in a few about teams of military members hunting down problem BF. I was involved in an encounter with a military helicopter operation. While I have no idea if what they were up to involved BF, they were sure interested in me, when they saw me observing the operation. A navy Sea King helicopter operating in the Gifford Pinchot forest smacks of Navy Seal operations to me. I have to think that some of these alleged events are based on fact rather than wishful thinking by BF advocates. If just one of these are based on fact, some components of the government is dirty and involved in a cover up. For those that think our government is clean only have to look at planned genocide conducted against the First Peoples of the United States. It is part of the government DNA to stomp on what it considers dissidents or troublemakers. This has continued right up to present times with people getting killed in the process. It is fascinating. The whole acknowledgment of the species and the cover ups. And the cover up isn't just for one reason (its fir the logging industry/etcs.) It opens up pandoras box and from there it branches off into other things like the economy, public reception, why didnt they acknowledge this 50 years ago? what else is out there? does sasquatch nao become an endangered species etc etc etc etc etc. "An even more inclusive listing comes from USA.gov, which lists 137 independent executive agencies and 268 units in the Cabinet. In a 2015 Senate Judiciary Committee hearing, one senator noted that “The Federal Register indicates there are over 430 departments, agencies, and sub-agencies in the federal government.”Aug 26, 2015"
Derek Randles has had a adversarial relationship with the Olympic National Park people. When he was deploying game cameras in quantity, they intervened and told him he would be fined significant money for each one if they found any more. That and the fact that he had little success, the last time I heard him talk, he had pretty much stopped deploying them. His BF expeditions have been required to be conducted mostly on private land. Again because of threats by the Park Service. That adversarial relationship suggests that they do not want him to discover anything. do you think BiGFo0Ters would have more success trying to get tangible evidence of Sasquatch by doing it solo? Then it’s a fish snd game issue and subject to dual state/federal management wildlife management agencies. BTW, all the bullspit we hear about “peer review” and publication in “reputable publications” is mute with government biological study. I’m quite familiar with biological studies published by the Alaska Dept. of Fish & Game, including those specifically funded and conducted fir the purpose of wresting control back from radical federal management agency dictates. True, and the possibility of a government official busting all of this wide open with a specimen is very real. We already have them filing reports of sightings, footprints, 911 calls, pouring plaster casts themselves, etc with private bigfoot investigators. “Looking humanish” doesn’t cut it. 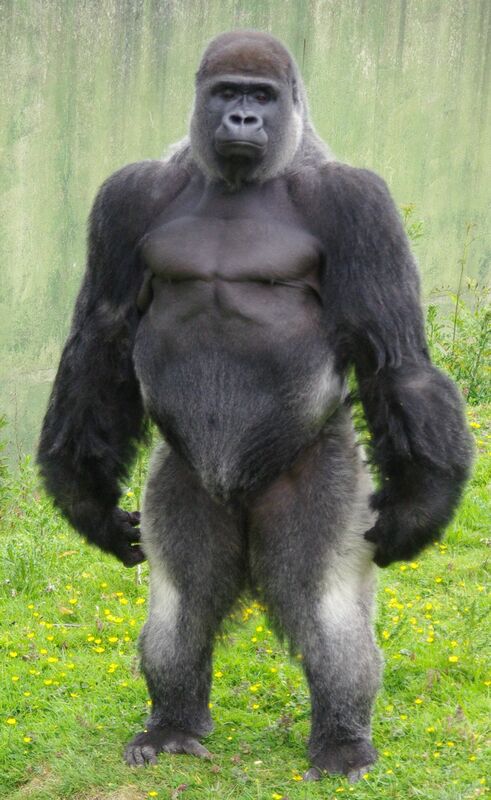 Gorillas are of the genus gorilla. Humans are of the genus Homo. Period.